The new bedding is a vast improvement as is the new tableware. The food is not much better than the old Do&Co catering on this route but then again LHR-JFK is BA's flagship service and has always received an extra level of care and attention. If BA can roll both the Do&Co and White Company partnerships successfully, fleetwide, they will go some way to undoing all of the harm that has been done to their reputation after the last three years of cost-cutting. Add in a new seat due in 2019 and then the only issue that remains is the poor quality of the lounges. BA don't exactly have an easy road ahead of them but for now at least, it appears that things are moving in the right direction. Perhaps I went into this with my hopes set too high but I really don't feel that this lounge is anywhere near the level of Cathay's Business lounge next door, let alone the First Class section. The Qantas decor isn't as luxurious, the food is not as good, there is a lack of natural light, runway views and power sockets and if you don't like gin, the drinks selection is far more limited. The JW Marriott Marquis is a 5* hotel but I think you'd struggle to make a case for it being a luxury hotel. For the price we paid I feel like we got value for money, however I would not have been happy if we'd been paying $500+ per night. Realistically this might be a Top 10 First Class product but in order to crack the Top 3 BA would have to make some serious changes. Of course, this would probably come at a higher cost, with less opportunities to redeem miles for the experience. BA's A380 First Class offers an experience truly worthy of the name. It is very pleasant, relaxing and comfortable. However BA falls short of being truly spectacular. Given what other airlines are doing with their flagship products these days, it seems a shame that a once great airline isn't aiming to beat the world. I was so happy to be able to share this experience with my Dad. I know how much he appreciates great wine and food and was delighted to be able to just hang out and enjoy his company on such a lengthy daytime flight. I did have minor reservations going into this, a fear that SQ would deliver a second rate experience and the crews would be disinterested, given that the route was due to be scrapped. In addition to having one of the best business class products in the sky, Qatar Airways frequently offers some superb airfares between Europe and Asia Pacific. As a promo for the launch of their service to Sydney, Qatar greatly discounted what has long been one of the most expensive routes in the world. 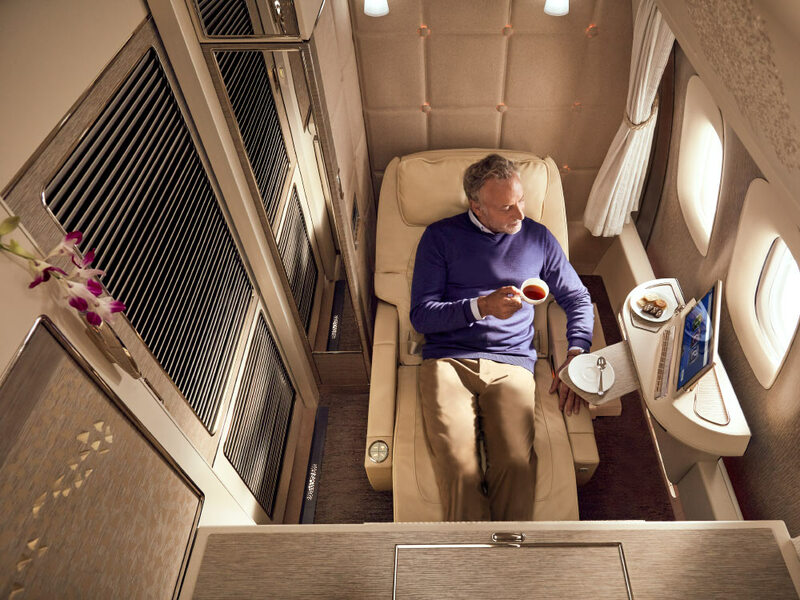 Many carriers don't offer service on this level in First, let alone business class. There are people out there that refer to Qatar crews as robotic but this welcome seemed anything but and really set the scene for the wonderful flight that was to follow. The main service was chaotic, no doubt about it. However, the dine on demand really came into its own when I wanted to set my own schedule and here, much like at the bar, the service was sincere, friendly and professional. I booked this flight between Sydney and Melbourne in business, in the hopes of securing some time in Qantas' flashy new seats. As is customary in the world of aviation, Qantas was familiarising the crew with the new cabin on a short flight before rolling out the seat on longer routes.